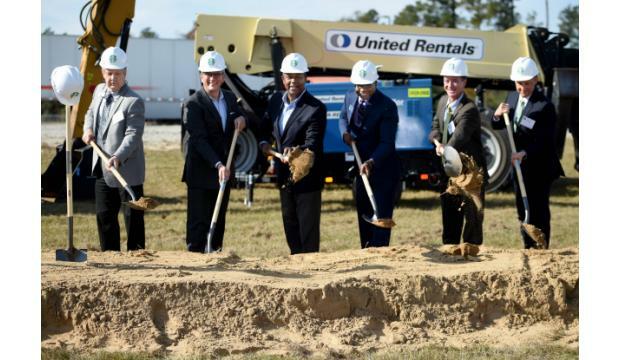 The world’s largest coffee retailer broke ground Wednesday in Augusta on a 140,000-square-foot plant expansion expected to bring more than 100 new jobs to the area. Starbucks opened a soluble coffee plant at Augusta Corporate Park in 2012 to produce its VIA Ready Brew line of instant coffees. Wednesday’s ceremony marked a $130 million enlargement of the facility’s north side. Starbucks executive Hans Melotte told the audience at the groundbreaking that, through the plant’s dedication to quality and customer service, “this site has earned this investment.” He is the executive vice president in charge of Starbucks’ global supply chain. “And if you couple that with the surround-sound system support that we enjoy from the city, the Economic Development Authority, etc., that makes a magical recipe for us to continue to express our commitment to this region through this investment,” Melotte said. One in six employees at the Augusta plant is either a military veteran or a military spouse, according to Augusta Plant Director Tim Filipowski. Also, through partnering with 15 area nonprofits, the plant has logged about 3,000 volunteer hours among its employees, he said. Deke Copenhaver, now the AEDA’s acting executive director, was Augusta’s mayor in 2012 when he sat on the team that recruited Starbucks to Augusta. The company’s arrival garnered so much attention, CNN covered the initial groundbreaking. “It’s just gotten better from there,” Copenhaver said. The expansion will add six new whole-bean coffee roasters, bringing the factory’s roaster total to eight. This increased capacity will allow the plant to offer packaged and soluble coffee. On Oct. 19, the Augusta Economic Development Authority signed off on a $130 million industrial revenue bond issue to fund the plant expansion. The vote finalized an “inducement resolution” approved in September that allowed Starbucks to seek financing, using the authority as a conduit. The Augusta plant is one of nine Starbucks-owned manufacturing and distribution facilities. The company plans to create more than 68,000 jobs nationwide by fiscal year 2021. The additional Augusta production line is expected to bring total employment at the facility to nearly 300 when the project is scheduled to be completed in fall 2019. Arabica coffee beans are shipped to Augusta through the port at Charleston, S.C. The plant roasts the beans and turns them into a powder for VIA Ready Brew products. The new roasters will package whole or ground beans in bulk for use in Starbucks stores, and in 16- and 20-ounce packages for retail. The plant also produces the coffee base for the company’s Frappuccino brand blended beverages and many of Starbucks’ ready-to-drink beverages.